Just like people, our plants benefit from having the right partner at their side. The concept of companion planting has been around for thousands of years. The Native Americans practiced it actively. Most die-hard gardeners have heard of the concept of the “Three Sisters.” This is a common term used to describe the mutually beneficial relationship between beans, corn and squash. The corn acts as a natural trellis for the beans that love to climb. The beans add nitrogen to the soil, in return benefitting the corn. The broad leaves of the squash provide shade at the soil level, keeping weeds at bay and the soil moist on hot sunny days. I always loved the combination of tomato and basil. It not only tastes incredible together but there is a reason for cultivating these plants next to one another. The basil is a natural insect and disease repellant that helps protect the tomato plant. At our garden center we create “Pizza Pots” that you can place on your patio or balcony. These pots contain tomato, basil, parsley, oregano, chive, and pepper plants, which all grow together wonderfully. On a warm summer Friday evening these will be an awesome addition to your homemade pizza prepared on the grill. Here is a very helpful companion planting resource guide created by the Cornell Cooperative Extension Saratoga County. This simple reference sheet clearly shows which plants grow well together, the protection certain plants can provide one another, and even plants that inhibit the growth of others. As you plan out your garden this year, keep companion planting and crop rotation in mind. A little time thinking through these concepts can make a huge difference in your garden’s health and yield. 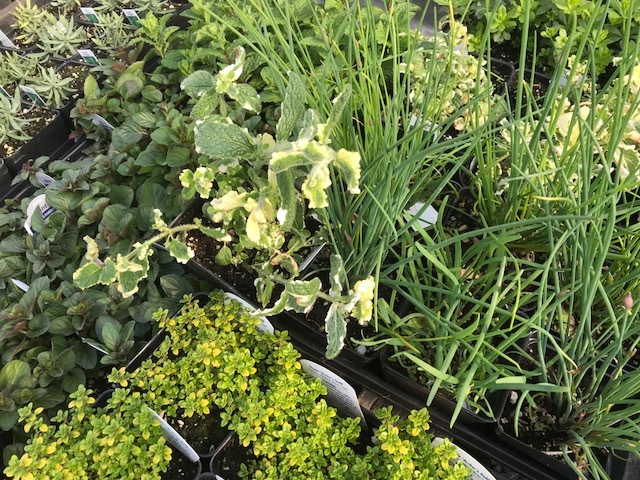 We have new heirloom tomatoes and a wide array of veggie plants and seeds. 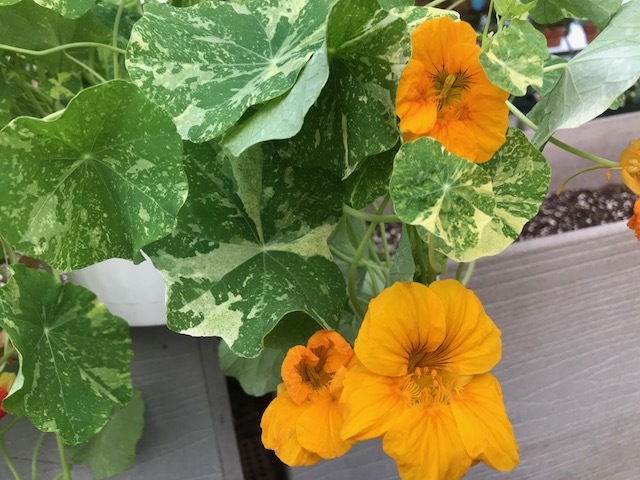 Let us advise you on planting a successful vegetable garden or maybe pick up some fun, unique hanging baskets that we have already planted for you. Bring along your garden diagram and let’s find plants that will live well and healthy together this year in your unique growing conditions. 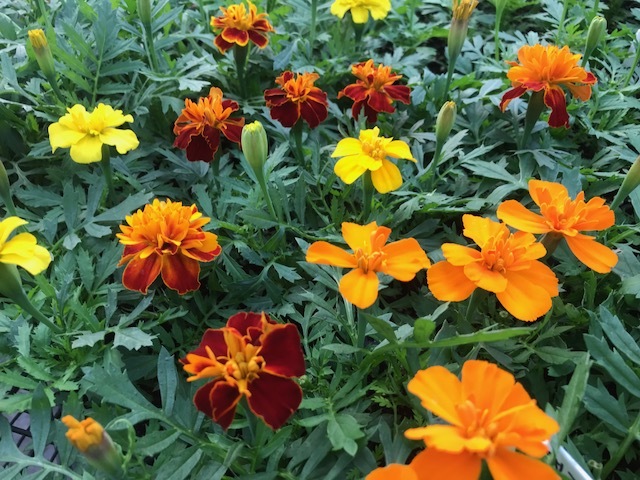 Marigold – Fabulous with tomatoes and squash; repels colorado potato beetle, nematodes and tomato worms, offering colorful blooms, too. Calendula – Repels cabbage moth with beautiful orange or yellow blooms. Basil – Repels tomato worms and aphids as well as improving flavor of most veggies. Borage – Has a beautiful blue flower that is edible and that taste like cucumber, repels tomato worms and squash bugs as well as improving the flavor of most vegetables. Mint – Make lots of mint tea and plant near the cole crops like broccoli to keep away the cabbage moths; also repels aphids and squash bugs. Summer Savory – Plant next to corn to control the borers. Chives, Onions and Garlic repel Japanese beetles, aphids and often rabbits. Rosemary or Lavender (beautiful flower) smells amazing and repels cabbage moth, bean beetles, carrot flies and mosquitos.